DALLAS (AP) Harrison Barnes and his Dallas teammates looked up and saw they trailed by 21 points midway through the third quarter on Thursday night. Barnes picked up the pace to finish with 31 points, including eight in overtime, and the Mavericks rallied to beat the Utah Jazz 112-105. When Utah last visited Dallas on Jan. 20, the Jazz won 112-107 in overtime. A big difference was that Jazz center Rudy Gobert, who had career highs of 27 points and 25 rebounds that night, fouled out with 22 seconds left in regulation and the Jazz leading 100-96. ”(Derrick) Favors is a good rim protector, too,” Dallas coach Rick Carlisle said, ”but Gobert is probably the best in the game. In overtime, Barnes’ drive for a three-point play ended an 11-0 run that began late in regulation and put Dallas ahead 107-100. Devin Harris scored the first four points of OT. Utah’s Gordon Hayward scored a season-high 36 points, but missed a 3-point attempt from the left corner as regulation ended. Nowitzki finished with 20 points. Gobert scored 15 points and added 15 rebounds. Dallas won for the first time in four games against the Jazz this season, and ended the Northwest Division leader’s four-game winning streak. The Mavericks had lost two in a row. Seth Curry scored 16, Matthews added 15 and Harris had 13 for Dallas. Joe Ingles scored 16 for Utah, which won at New Orleans on Wednesday and seemed headed to another victory when it stretched a 12-point halftime lead to 74-53. Jazz: G George Hill did not dress because of a sprained left big toe. He did not play in 12 other games this season because of the injury, and has missed 25 altogether. Dante Exum started in Hill’s place. … Ingles made all four 3-point attempts in the first half, but missed three in the second to fall short of tying his career high of five. … Gobert’s double-double was his 36th this season. Mavericks: C Andrew Bogut missed his sixth straight game since aggravating a strained right hamstring, and G Deron Williams (sprained left big toe) missed his eighth in a row. … Matthews left the game briefly in the first quarter, but returned after changing his shoes. Barnes had one 30-point game during his four seasons with Golden State, but has had six in his first season for the Mavericks, including a career-high 34 on Nov. 6. He has been the leading scorer in 28 of their 53 games. They’re 3-3 when he has scored 30-plus. Hayward has scored 30-plus points in three of the last four games. The Jazz are 6-2 in the eight games when he has scored 30. His career high is 37. Mavericks owner Mark Cuban will represent the Western Conference again this year in the NBA All-Star Celebrity Game on Feb. 17 in New Orleans. Cuban said he scored two points in last year’s game in Toronto, and doesn’t expect much more this year. 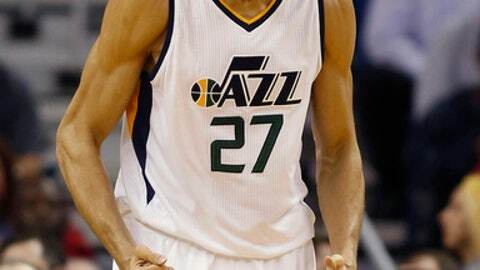 Jazz: Meet Boston on Saturday to begin a three-game homestand. Mavericks: Host Orlando on Saturday night in the third game of a four-game homestand.